Are You Practicing Dynamic or Static Recruitment? For several years, brothers and sisters of fraternal organizations have taken our free, online Dynamic Recruitment Assessment to receive a score to better understand how their chapter is currently recruiting. With a potential of 95 possible points, chapters are rated as Static (29 or under), More Static than Dynamic (30-54 points), More Dynamic than Static (55-80 points), or Dynamic (81 and above). Well, how’d you do? Better than you thought? Worse? Don’t worry if your score is lower than you pictured, you are not alone. We are here to provide you resources to make sure your recruitment practices can be in tip top shape by the start of this next school year. Check out some of the key areas we’ve learned that chapters struggle with the most, and find resources you can use to help lead your chapter to recruitment success! Our fellow fraternal friends most commonly struggle with how membership selections are made. The majority (58%) said that they make selections using phrases like “they’re cool” or “they seem like they will benefit the organization”. We need to be utilizing written, official criteria for selection that evaluates all potential members on an even playing field where we truly challenge if they are right for membership. Our members should be familiar and have a part in the conversation for the selection criteria. 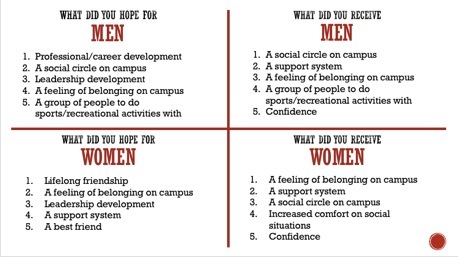 Check out these two resources for an example of criteria for men’s and women’s organizations. You can’t recruit who you don’t know. 86.5% of respondents said the average member in their chapter only has 1-5 close friends outside the organization and 72% said their average members only would know 1-5 individuals to consider for membership. Too often, I believe that we take the first group of people who knock on our door looking for membership rather than getting to know as many people as possible on our campus. This results in us taking in some questionable members, and coming across as exclusive and unapproachable to unaffiliated members. Check out this blog for how we can make more strangers become members. Do you have a names list for your chapter of potential candidates for membership? 75% said they do. This is great! However, most of our organizations struggle with how many names are on that list. Whether you are in a men’s, women’s, or co-ed organization, you should always be keeping a list of names (formal recruitment registration doesn’t count!) of potential members you could recruit from. 63% of our names lists only have 1-50 names on it! Using data from ChapterBuilder, we know that only about 10% of our names list will actually join our organizations. This means if we are looking to fill ten new member spots, we need at least a names list of 100 individuals to make that happen. Panhellenic sororities struggle with this the most. We rely so heavily on formal recruitment, if new members drop or total is not met, we spend chapter resources (members time, chapter money) to hold informal events in the hopes to meet our recruiting goals. If more time was spent creating relationships with non-members and growing our names list, there would be no need to host events. Instead, we could deepen already existing friendships and transform those relationships into new members. How do you grow your names list? To start, ask each member to write down the names of non-affiliated members who they would consider for membership. Need help? Check out these name joggers for sorority and fraternity. (*Hint* This activity should be done with every new member to see if they have any friends who could be interested.) From there we simply have to be more normal. Make friends outside of your organization, get involved across campus, and develop acquaintances and friends. Recruitment preparation is important so that our members understand how to identify quality members, can practice their pre-close, address responses to concerns, have stronger conversations, and so much more. We recommend doing this preparation multiple times over the year to alleviate some of the stress that often gets attached to recruiting. Currently, only 4% of chapters have numerous, year-round trainings and is completely prepared to recruit. Most chapters are either somewhat prepared with one training a year (39%), or are a little prepared and have only mentioned recruitment without any training (34%). Check out these resources for pre-closing for men and women. Check out this blog on the fundamentals of a pre-close. Need more help preparing for recruitment, or want to take your assessment a step deeper? Contact me at erin@phiredup.com to chat more about your Dynamic Recruitment Assessment results! This semester I went to the most impactful new member meeting I’ve ever attended. The group sat in a circle. Challenging topics were discussed passionately. Loneliness, confidence, mental health. Everyone clearly wanted to be there. There were tears, hugs and heated discussions. There wasn’t a test at the end. Oh, one more thing: it wasn’t a fraternity meeting. The organizer actually dropped his fraternity a few years back. I was in Myrtle Beach visiting a friend who lives in town. He was raving to me about weekly G-night meetings he’d been attending, as well as the intentionality of his friend Carson who runs the show. Carson had grown up in heavily masculine environments, including football throughout school and a fraternity when he began college at Coastal Carolina University. While he built many strong relationships, the negative groupthink he experienced caused him to drift away from both. He found the groups to be pressured to act a certain way even if that didn’t reflect members’ beliefs coming in. It’s frustrating to me that fraternity can both attract and lose people like Carson, but it shows that the experience isn’t for everyone. Above all, Carson found fraternity life to go against his values as a man seeking a life of faith. So he started his own men’s group. The purpose was to get men closer to God, but he chose to do so in a different way–discussing topics relevant to their struggle of growing as men. He wanted men to see the benefit of God without being in-your-face about it, a problem that he had seen plague the development of other faith groups. Carson chose to vaguely call the events G-nights for that reason. Did it stand for God? Guy stuff? Girl problems? Did it matter? That was the beauty of it, according to Carson. New member education wasn’t on my mind at all coming into the meeting. I went because my personal growth as a man has been tough. Like many young men, I drifted from my faith in college due to a new environment, independence, and unlimited daily distractions. I am not fully ready to jump back in, but wanted the overall feeling of spirituality back. It wasn’t until the meeting got going where it really hit me that Carson was doing exactly what most fraternity new member groups aren’t. Carson told me afterwards that he believes young men have two primary needs: to be seen and to be safe. He felt that the former was hurting men everywhere. Most of the damaging behaviors in other men’s groups he had seen involved guys desperately seeking social approval: the status of being in X group, the party access, the crude jokes, etc. They would do whatever it took to be seen. G-night was created for men to be safe. They can talk freely about personal hardship, express deep emotions, and touch topics that may be uncomfortable with girls or even family around. I didn’t fully get this at first. Carson’s group resembled a fraternity chapter much more than a youth group; backwards caps, jerseys, sweats and tattoos filled the room. But they were craving safety. This particular conversation was about the challenge of relationships. It was a rocky area that many people were reluctant to contribute to at first. Carson set the tone of vulnerability and the importance of everyone feeling safe to share and grow through the experiences of others. As the environment of trust was cultivated, it got deep. Men opened up about previous relationships where physical attraction kept them from emotional connection. Others shared their fears of not finding a partner or comparing their situations to others. One man opened up deeply about an abusive relationship with a parent that made him question his own future. G-night was powerful, and reminded me of a similar concept I saw play out recently. God’s Plan became an anthem of fraternities and other similar settings nationwide this spring, playing across parties and tailgates. Perhaps this isn’t surprising given the song was by Drake, an artist who makes music automatically considered cool based on the image built through his massive fan base. Listening to Drake helps people be seen. But I’d go a step further. The song’s wide prevalence showed people were willing to listen to a message that (to me) mirrored aspects of G-nights. Spirituality was introduced subtly, as it broadly indicated that even in a stressful daily life, God has a plan for Drake and those listening. Specific pressure to be religious was avoided, but a positive message was continuously reinforced. If you want proof, definitely watch the video. It’s a tough era to be a man, but fraternities can be the answer. Carson’s G-night model provides a blueprint. If God’s Plan, G-night, and spirituality collectively have taught me one thing—it’s the following lyric. What role should spirituality play in our organizations? Are we utilizing it to the level we could? Could it further connect us to ritual? Email me at Farrell@PhiredUp.com to begin a conversation! I’d love to hear your thoughts connected to spirituality and fraternity, and how it could help us make men feel both seen and safe. This blows my mind. Here we are, SOCIAL ORGANIZATIONS, and our members struggle to find friends? The more I reflect on this, and the more I dive into question mode to learn why, I can’t help but think that fraternities and sororities have failed to define and create an expectation on what friendship REALLY looks like on the inside of our organizations. Think about it. We preach brotherhood and sisterhood, which implies a family-like connection with others. We show photos of us laughing and being best friends with each other on our social media and during recruitment. We share stories about the fun things we do as an organization. What we don’t do is set the expectation that this close family-like connection does not come automatically with a bid. Actually, most individuals I talk to shared that it takes anywhere from a semester to a full year to find the people in their organization that feel like family. That connection is there waiting for us, but it takes time to find and build. I remember being a new member, having just received my bid, and showing up to sorority events or chapter meetings feeling like a fish out of water. It seemed like everyone had a place to belong and that everyone had those best friends. I found myself floating around in social groups, having surface level connections but never finding anyone I felt comfortable getting deeper with. I met sorority sisters who were nice, but had different majors or interests. I met sisters who I honestly couldn’t stand being around. I didn’t dislike any of them, they just weren’t MY people. I had resilience and kept trying, and boy was I lucky to find some sisters that are still a part of my life today. I found a few of them after a semester, but some of my strongest relationships took a few years both in and out of the sorority to fully develop. Be Honest- The first (and maybe most obvious) thing you can do is simply be honest with your new members and potential members. In recruitment, don’t feed them lies about finding 100+ new BFF’s the instant they join. We know this is what they want to hear, but this is not reality and they will feel lied to once they join. Explain what to expect, tell them how long it took you to find your people, tell them HOW you found your people. Tell them about the difference between friend groups and cliques. Most likely they aren’t being purposefully excluded, it’s just hard not to have friend groups in an organization with 100 or more people. Tell them that they don’t have to love every individual, they just need to respect them and treat them as an equal. Be a Connector- Spotting that fish out of water is not hard. Look for the people sitting alone, not engaging in conversation, or who stop showing up altogether. You don’t need to become their best friend, but what you can do for them is to get to know them and start introducing them to other members who you think they may get along with. This is especially what can be done if you are a big or mentor to a new member. Just because you have this title and connection to them does not mean you are forced to create the family-like connection. Your role is to help them find their people and find where they feel most comfortable. Be Real- Don’t be a “Me Too-er”. The worst thing you can do is fake connection and friendship by feigning interest in the same thing as another individual. If they are talking to you about Harry Potter and that’s not your jam, don’t pretend you like it too. Be real, say that you never got into it, and let them teach you something about their passions or interests. Nobody said you had to like the same exact things to build connection, but you do need to be authentic. If you’re reading this and thinking, “man- I still haven’t found my people yet”, know that it is okay and totally normal. It takes time. Don’t give up. Your people are out there. Take this opportunity to be real and honest as an individual and ask for help, ask someone to be a connector. Your organization and its members are designed to support you, sometimes they just need a little push or reminder that you are having a hard time. Strong friendships take time to build. Telling our new and potential members anything else is lying to their face. That’s not the way we retain members and not the way we build trust. I challenge you before you recruit this year to have some real, honest conversations with your chapter about how to have these conversations and set expectations before you recruit your next group of brothers and sisters. The future of fraternity and sorority freaks me out a little. Yeah, I said it… I’m not just referring to what we see in the news every day, I’m referring to the lack of proprietary value added to a college student’s life by membership in a fraternity or sorority. What on earth does that mean? Simple. The current fraternity and sorority experience is struggling to meet the needs of our new generation of incoming college students. Right now, seven universities partnered with Phired Up’s research department to pilot a brand-new longitudinal study that examines the experience of a potential member as they continue through their first year of membership in a fraternity or sorority. We are only in the second phase of three, and already the results spin an interesting tale. We asked potential members before recruitment what they hoped to gain from their sorority membership. We weren’t surprised to hear a common theme that we labeled “Belonging”. This often included descriptions of individuals expecting to find friends, a family, a place to feel at home on campus, and even mentioned brotherhood/sisterhood specifically. We learned that this is an expectation; potential members come into recruitment or intake expecting that they will find a sense of belonging. What was truly interesting is what we started to call, “Belonging & _____”. Very rarely did any individual say they JUST wanted to find belonging. There was often this “and” statement that was followed by a “desire” they had for their membership. This “desire” was different for men and women. But do we actually give them what they desire? Currently, we only deliver on what they expect. What our members are telling us is that they receive social benefits only. And that’s not all that bad! Granted, these results are what new members receive one to two months after recruitment (which for most is the new member phase). Either way, we know that the incoming generation wants instant gratification and instant results, and right now all we are showing them is that they only receive what they expect (and not what they desire). Here’s the part where I start to get a little freaked out. We also asked non-Greek members (individuals who had shown interest in fraternity/sorority and choose not to join) the same exact question. What did non-members gain from their college experience one to two months after recruitment? Is fraternity and sorority worth it? I believe in the future of fraternity and sorority. I also believe that the fraternity and sorority experience is going to need to adjust to the desires of the incoming student population if we want to continue to see our organizations flourish. So here’s my challenge to you: No matter what role you play in this community – volunteer, advisor, president, member, staff – I want you to think about how you can provide those desires to our members. Knowing that the solution to our problems isn’t always creating more programs, how do we let members make an impact? How do we develop them as leaders? How do we prepare them for their future? We need to do this at all levels: the campus, the headquarters, and the chapter, or our future may be more scary than we thought. What ideas do you have to help deliver on the desires of potential new members? I’d love to hear them! E-mail me at Erin@PhiredUp.com and share your thoughts and questions with me.